Under the most optimistic scenario, the catastrophic gas leak at Porter Ranch might be plugged by the end of this week, according to a recent announcement by a California state official. However, other state officials and the SoCalGas company warn it could take until the end of the month. Ever since a natural gas storage well near the Los Angeles-area community of Porter Ranch ruptured on October 23, heat-trapping methane has been spewing into the atmosphere, creating an environmental and public health disaster that’s been compared to the BP oil spill. In an effort to plug the leak, SoCalGas, the company responsible for the well, began drilling a relief well on December 4. At the time, SoCalGas warned that it could take until the end of March for the gas leak to be plugged over 8,000 feet beneath the ground. It seems we’re now close to hitting that milestone early. But there’s still critical work to be done in the days ahead. 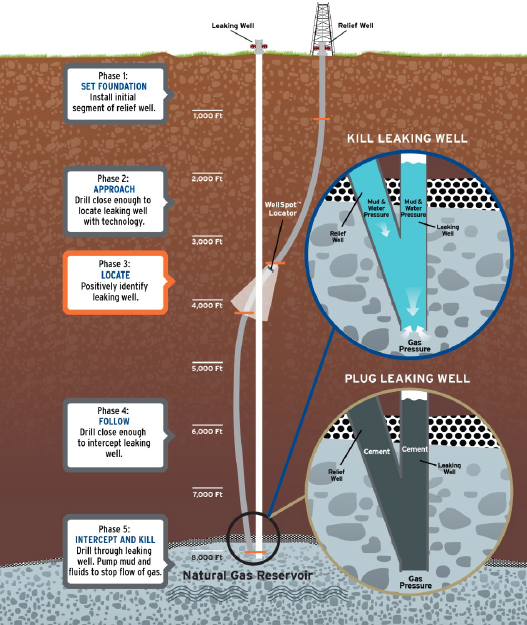 The graphic below outlines the company’s plan to kill the leaking natural gas well. SoCalGas is currently in the final phase of the drill operation, having reached a depth of approximately 8,560 feet on February 4th. Phase five entails intercepting the well, pumping mud and water in to stop the flow of gas, and finally, sealing the entire thing with cement. And many things could go wrong. The relief well could miss its target, the injection of mud and cement could prove difficult, or the plug itself could fail to halt the flow of gas. After the cement has dried, state regulators will have to confirm that the leak has stopped. Wade Crowfoot, a senior advisor to Gov. Jerry Brown, told those at a public meeting at Cal State Northridge that the relief well that is still being drilled was tentatively expected to intercept the leaking well as early as Monday. After reaching the well at the Aliso Canyon Natural Gas Storage Facility, Southern California Gas Co.’s crews could then begin sealing the well in a process that could take “certainly not less than five days,” he said. SoCalGas will hardly be off the hook once the well is sealed. Last week, the LA County District Attorney Jackie Lacey filed criminal charges against the company for failing to immediately report the leak. If convinced, SoCalGas could pay up to $25,000 for each of the three days it didn’t notify the state, and $1,000 for each day of air pollution violations. SoCalGas also faces potential class action lawsuits from residents, whom it didn’t begin relocating until it was ordered to do so by public health officials a month after the leak began. Since then, the company has furnished temporary housing for some 4,400 people, many of whom reported dizziness, nausea, nosebleeds and other symptoms. The LA Department of Public Health attributes these health issues to foul-smelling sulphurous compounds called mercaptans. According to an agreement with the LA city attorney, SoCalGas can stop paying for short-term housing for Porter Ranch residents 48 hours after the well is declared sealed, a provision which has many residents worried. Meanwhile, every day that the leak at Porter Ranch goes unplugged, it continues to spew out methane, a potent greenhouse gas with up to 80 times the global warming potential of CO2. The Environmental Defense Fund, which is monitoring the leak in real-time using data collected by the California Air Resources Board, reckons that over 94,000 metric tons of methane have been released so far. That’s equivalent to nearly 8 million metric tons of CO2, or 900,000 gallons of gasoline burned. Gizmodo has reached out to SoCalGas for an update on the company’s expected timeline for plugging the well, and we will update if we hear back.